European air chaos brings Málaga airport operations to a minimum | Marbella Marbella – Adelante! The air chaos caused by the cloud of volcanic ash that has closed most major European airports was noticeable for a fifth day yesterday at the Málaga aerodrome. The most noticeable feature was the lack of activity at flights-cancelled counters or queues of passengers at airline counters and tour operators waiting for refunds on tickets or alternative bus travel or hotel stays. Passengers waiting in Málaga airport, hoping to return home. According to data from Aena, a total of 697 flight operations have been cancelled at the airport in Málaga since the continent-wide suspension of air traffic last Thursday, with 60% of the 1,214 flights planned on Monday cancelled. On Sunday, 309 arrivals and departures were cancelled. 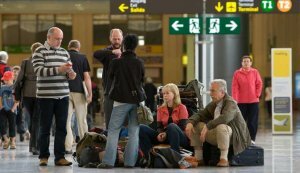 Aena points out that no domestic flights were cancelled. The largest number of cancelled operations on Sunday were between Spain and the UK, with 108, followed by Germany (30), France (16), Ireland (12), Switzerland (10), Belgium (8) and the Netherlands (8). Since Thursday, nearly 100,000 passengers at the aerodrome of Málaga have been affected. So desperate is the situation for British travellers that Prime Minister Gordon Brown has said the British Royal Navy will arrive along the southern coast of Spain – Costa del Sol, well the majority of tourists are British – to ferry U.K. citizens home. Across Spain, as well, nearly 3,200 flights were cancelled over the weekend, affecting more than 40,000 passengers over just two days. On Sunday morning, Aena closed 16 airports, the largest of which were Barcelona, El Prat, Alicante, Palma de Mallorca, Bilbao, Girona, Santander, and Pamplona. These airports reopened in the afternoon. Throughout Europe, airlines are bleeding a total of 185 million euros daily as the crisis continues, and the European Union is now considering economic aid packages that may exceed those provided in the wake of 11 September 2001. Hotels are also feeling the effects, and hoteliers are worried that the damage to their industry may reach dimensions that no one has seen before. José Carlos Escribano, president of the Association of Hoteliers of the Costa (Aehcos), said economic losses are insured, but that industry experts are still unable to take stock of the situation. ‘What we’re trying to do now is minimise problems at airports, so we are in contact at all times with tour operators to keep travellers in hotels’, Escribano said. He acknowledged that although hotels are not empty, they are receiving far fewer tourists than expected for the summer pre-season. Apart from hotels, two other services are noticing the effects of the chaos. One is the taxi drivers. ‘This week has taken us to the bottom’, said José Gaspar, an employee who, along with many others, waited patiently yesterday in the arrival area of the airport for someone who needed his services. Some 170 taxis on duty at the airport over the weekend did not carry a single passenger. As a result, taxis are now avoiding the airport. ‘Most stay in the city to see if they will have more luck with passengers wanting trips to the Málaga Film Festival‘, the driver added. Similarly, José Palomo, an independent driver, said the widespread flight cancellations could cost every driver around 600 euros. ‘I’ve been parked here since nine o’clock in the morning and I have not moved yet’, Palomo said. The other sector that has had to modify work patterns is the car leasing industry. Local leasing agencies are suffering more because passengers do not arrive at Málaga requiring their services. ‘Only the people who want to extend their hire for two or three days, waiting for their flight back home, or who want to return a car, are coming, but we have no new customers, so this is going to generate losses’, said Bienvenido Luna, agent for Málaga Car. International car leasing agents, however, are taking a flurry of requests for services to foreign destinations. ‘The phone has not stopped ringing all morning. Clients do not stop asking for cars that they need within two or three days at branches in other countries like Holland or France’, said an employee of Avis.